Teledyne Test Services (TTS), together with our clients, have developed a comprehensive AOV Design (ACE), System Analysis (ACEDP) and Test (ACETest) Databases available to the industry for utility AOV program control. The software is currently in use at Entergy, Exelon, TVA and Arizona Public Service. 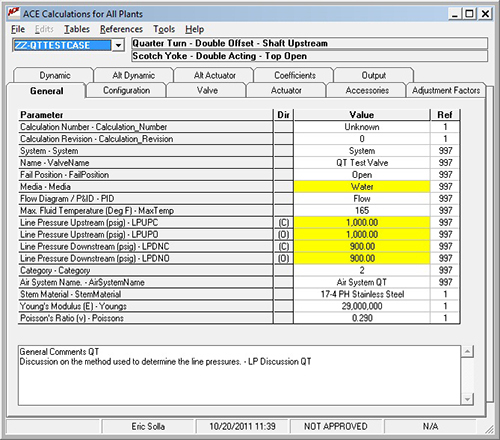 ACE, ACEDP and ACETEST software are developed, maintained and documented using software Quality procedures developed by Teledyne. ACE, ACEDP and ACETEST are delivered with a Certificate of Conformance attesting to this fact. Teledyne has developed a client/server implementation for ACE, ACEDP and ACETEST. This allows for a single installation on a server for the entire utility, including all remote sites. Teledyne provides an unlimited usage license for the entire utility. An optional Setup Window may be created. Setup Window is displayed graphically. Post-Test Evaluation is performed via a series of questions while displaying both design and test data for review. Test data may be imported from QUIKLOOK or Viper or entered manually. A Test Summary is presented showing As-Found and As-Left results. Tester and engineer comments are included. A Test Log lists all tests performed.